Clip ‘n Climb Phillip Island is bringing the outdoors inside with the newest concept in indoor climbing. Get active, get healthy in a safe, fun and family-friendly environment. Vertical challenges varying in difficulty and design will keep everyone engaged from beginners to experienced climbers. In addition to our colourful climbing walls, we have also have Virtual Reality experiences available. Our Virtual Reality Pods are based on a 3D motion platform complete with seat vibrations, realistic ‘back pokes’, leg sweeps, wind effects and full surround sound. Sit back, relax and enjoy the ride. 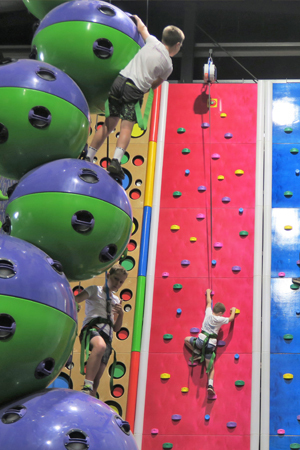 Get ready for an awesome full on adrenaline experience – an amazing indoor venue for both kids and adults to enjoy. Bookings essential during peak periods.